Day 3 “gravy” and pizza, oh my! For breakfast we all tried these ak-mak crackers (mainly because they are fun to say, but also to see if anyone likes them). They are really good and filling! We had them topped with butter and hard boiled egg and smoked salmon OR with peanut butter and jelly. Kids also had bowls of unsweetened applesauce that I dressed up with cinnamon and agave syrup. Lunch was fried egg sandwiches with cheddar cheese on buttered whole wheat toast and a side of grape tomatoes. As I mentioned, this bread was not great, so I was happy to finish it off. I made another loaf in the afternoon that looks and tastes much better. But the 9 y.o. picky bread eater hasn’t tried it yet, so the jury’s still out. Bill, the 5 y.o. and I hit the Co-op for a pretty big shop in the afternoon and all shared a bag of the Kettle Brand Bakes sea salt chips. I’m so happy to be eating potato chips again! And that reminds me to add “figure out an all natural version of Lipton Onion Soup Mix chip dip” to the priority list (note to self: it does not have to be that weird brown color). I coat the bottom of a heavy pan with about 2 T. olive oil and cook the chopped onion – with some salt and pepper – on medium until translucent. Then I slop in whatever red wine I am drinking or have open in the fridge — about 1/3 c. Cook until onions look “jammy” (10 mins or so). While onions cook in the wine, smash or mince the garlic and throw it in. Then the fun part! (And I have no idea why Fran did it this way – but it makes the perfect texture sauce and I don’t like any other texture to my sauce) Puree both cans of whole tomatoes in a blender (I have to do them one at a time). Pour that into the jammy onions and garlic. Add the crushed tomatoes. Then throw in a bunch of oregano (about 2T), a little basil (1t), a couple sprinkles of garlic powder, more salt and pepper, and the parmesan rind. Lower heat and simmer for an hour or so (cover it if it’s not cooking fast enough, take the cover off if it’s getting too thick) — you can add cooked meats at this point (meatballs, braciole, sausages). After about an hour, I add some water if it’s looking too thick, taste and adjust the seasonings. 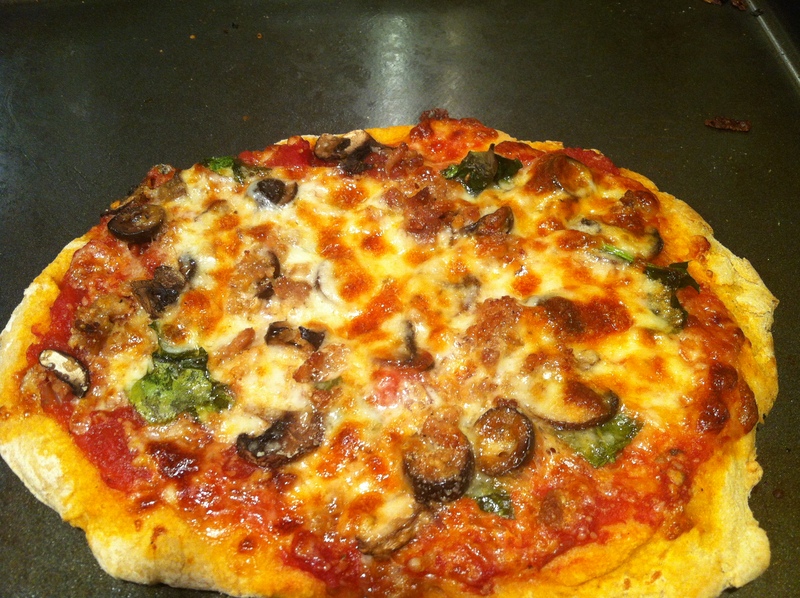 I froze about 2/3 of it, put some in the fridge for pasta night in a few days, and used the rest to make PIZZAS! These were a huge hit with the kids and were easier to make than I anticipated — happy dinner time! The recipe for the whole wheat crust is from 100daysofrealfood – but I’m working on some modifications and will post my version soon. 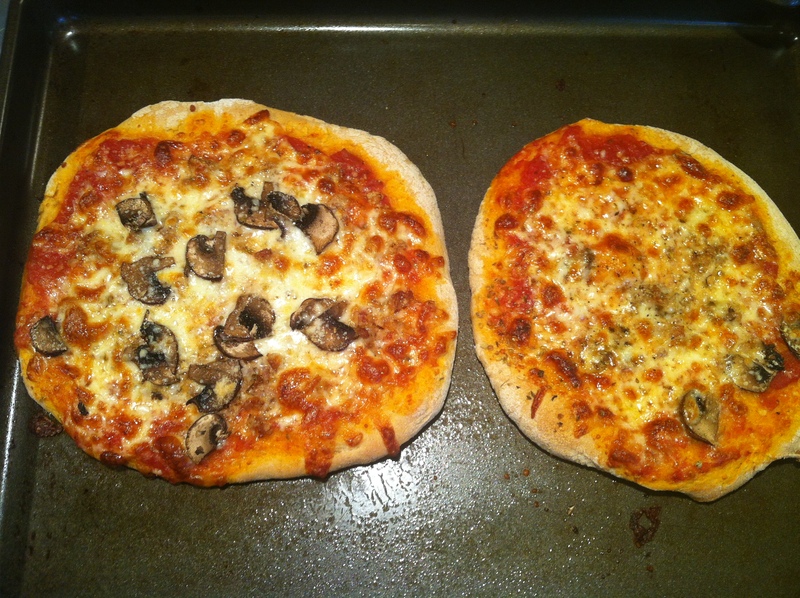 Boys put “gravy”, fresh mushrooms sausage crumbles, mozzarella and parmesan on theirs. ← Day 2 AND a restaurant report. Those pizzas look amazing! Do you deliver? Pingback: Day 7. Out for lunch. Pasta dinner. | Real Food. Real Family. Real Midwest. Pingback: Day 35. So what? | Real Food. Real Family. Real Midwest. 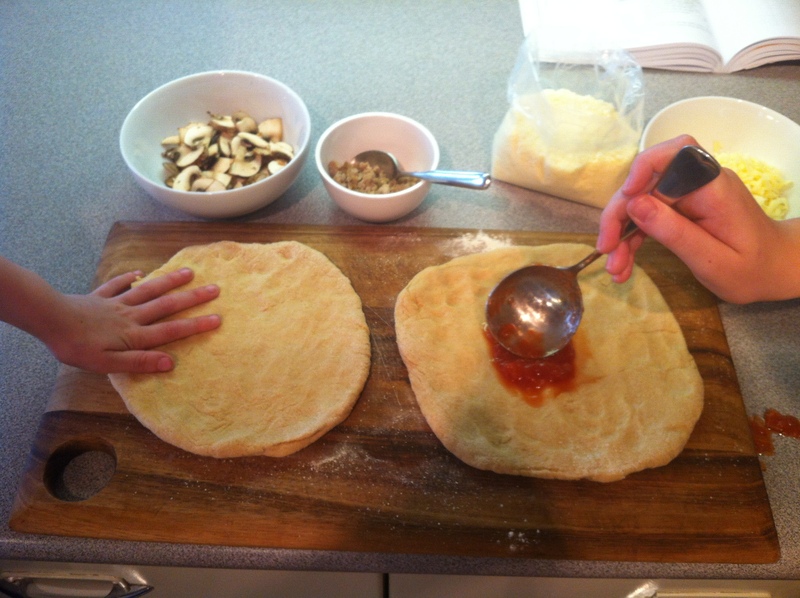 Pingback: Practicing pizzas. Still. | Real Food. Real Family. Real Midwest. Pingback: Two dinners. | Real Food. Real Family. Real Midwest. Pingback: Two more dinners. | Real Food. Real Family. Real Midwest.